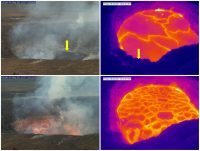 This past week, Kīlauea Volcano’s summit lava lake level fluctuated with summit inflation and deflation and ranged about 31–53.5 m (102–175 ft) below the vent rim. 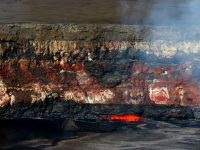 On the East Rift Zone, the 61g flow remained active, with lava entering the ocean near Kamokuna and surface breakouts downslope of Pu‘u ‘Ō‘ō. 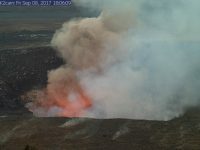 Widening cracks and slumping on the Kamokuna lava delta indicate its instability and potential for collapse. The 61g flows do not pose an immediate threat to nearby communities.